We thank the Capital Survey Research Center for so graciously responding to our request for a death penalty survey in Alabama and we thank all who contributed to this survey. It confirms that a solid majority of the people of Alabama believe that the time has come for a moratorium on executions while an independent study is conducted into the fairness of the application of the death penalty. It also confirms that most Alabamians do believe in justice and that candidates running for election can embrace it and win. Looking at the numbers, it is obvious that Alabamians are uneasy about the application of capital punishment in their state.We hope that the candidates are listening as they develop their platform! Education remains the key and so we look to you to help spread the word. When I wrote last week 300 organizations, churches, businesses etc had come out in support of a moratorium. We now stand at 340! Does that not tell you that the time for a moratorium is NOW? Please spread this survey widely! On this page, we include a news report on the polling data and then we'll have a look at the particulars. First, here's an Associated Press news item regarding the poll. 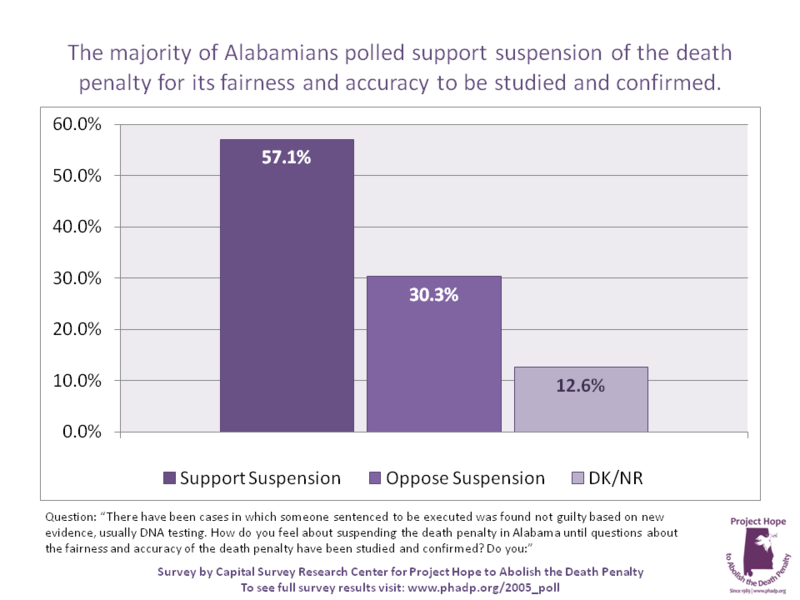 BIRMINGHAM, Ala. (AP) A large majority of Alabamians in a new poll support the death penalty, but 57 percent would suspend it until questions of fairness and reliability are studied. The statewide poll, released Thursday, found 71 percent strongly support the death penalty, but less than half, 47 percent, believe the death penalty is applied fairly in the state. Also, 80 percent think an innocent person could be executed, according to the Capital Survey Research Center's poll of 863 likely voters statewide. The center is the polling arm of the Alabama Education Association. The survey, which has a 3.5 percentage point margin of error, was conducted July 12-21. Center director Gerald Johnson said the poll's results were consistent. Though voters support capital punishment, they question its fairness and believe steps could be taken to improve its accuracy. "It's an impressively logical sequence," Johnson said. The poll results encouraged opponents of the death penalty. "The evidence of unfairness surrounding the administration of the death penalty is so overwhelming that it's not surprising that more folks are acknowledging it," said Bryan Stevenson, a Montgomery lawyer and director of the Equal Justice Initiative. 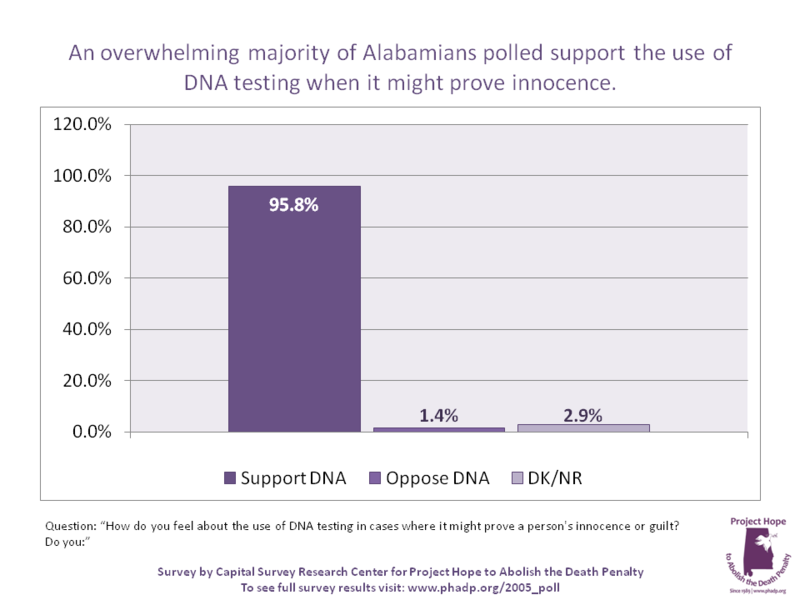 The poll also found that 62 percent would be more likely to vote for a candidate who supported suspension of the death penalty until questions about the use of DNA testing have been answered. Esther Brown, who leads a moratorium movement in the state, said 37 local governments and more than 300 churches, businesses and political groups have signed her petition calling for executions to be suspended while the system is studied. "I'm hoping that the people running for office will see that and understand that supporting a moratorium is not something that's going to harm them," said Brown, executive secretary of Project Hope to Abolish the Death Penalty. State Sen. Hank Sanders, D-Selma, has introduced a moratorium bill for several years without success. The new poll also found that 96 percent of people support the use of DNA in cases where it might prove guilt or innocence. Now, here are more specifics about the poll data. 2. Do you believe the death penalty is applied fairly in Alabama regardless of gender, race, income or age? 3. Do you believe an innocent person may be convicted and executed? 6. 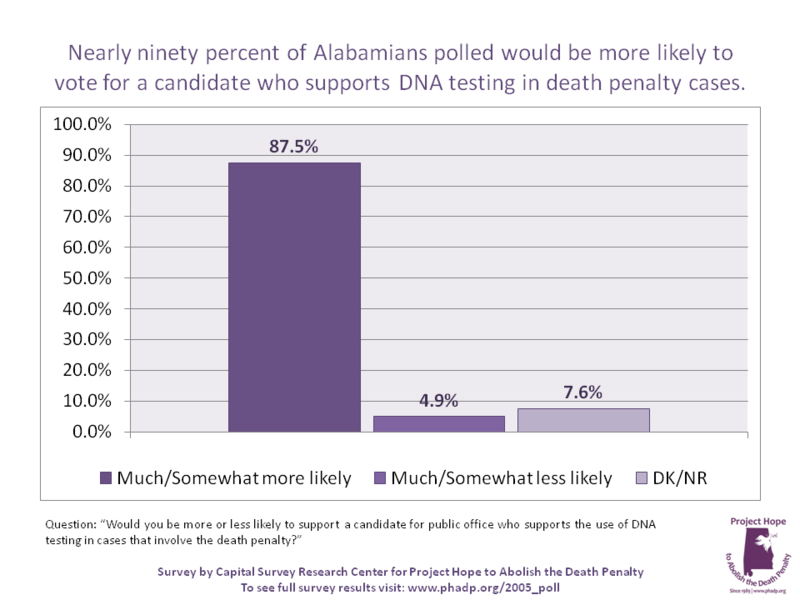 Would you be more or less likely to support a candidate for public office who supports the use of DNA testing in cases that involve the death penalty? 7. Would you be more or less likely to support a candidate for public office who supports a suspension of the death penalty until questions about the use of DNA testing have been answered? There are some important things to note in this data. 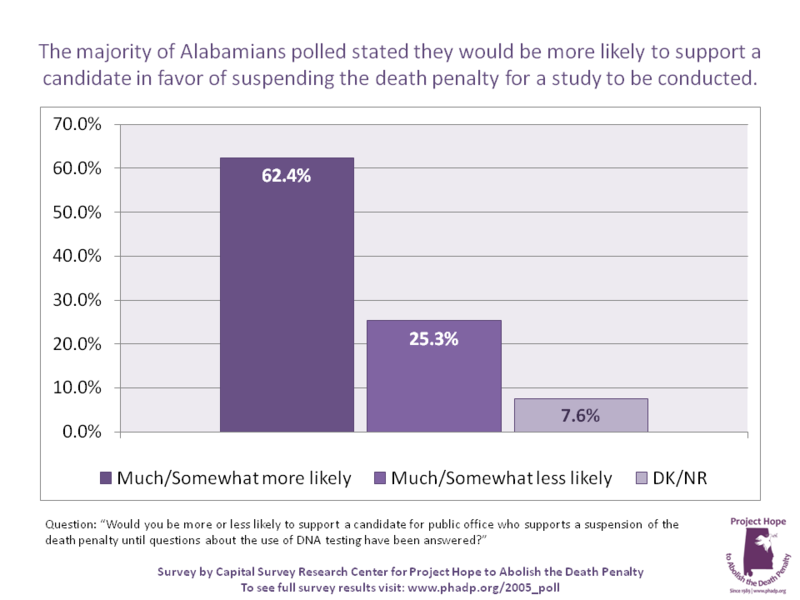 First, and perhaps the biggest news is that in spite of the fact that most Alabamians support the death penalty, and this is no surprise, a majority would now appear to support a moratorium. Second, note the near-unanimous support of the use of DNA. Many of us who dialog regularly with death penalty supporters routinely find that they are shocked to learn that there is no automatic right afforded a defendant to have his or her DNA tested and used in his or her defense. 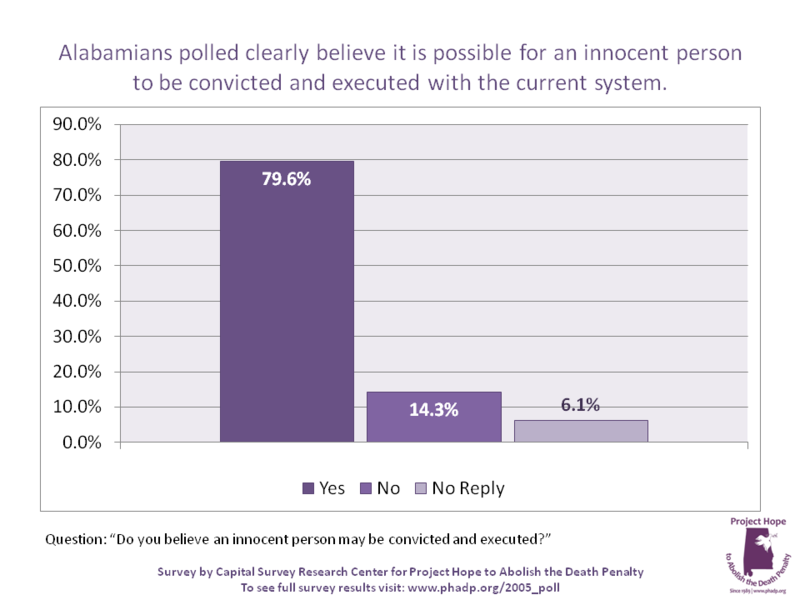 Third, a finding that is baffling and somewhat disheartening, 70% support the death penalty and nearly 80% concede that "an innocent person may be convicted and executed." Aren't we forced to conclude, here, that those who favor the death penalty favor it so strongly that they are willing to accept the execution of innocent people?